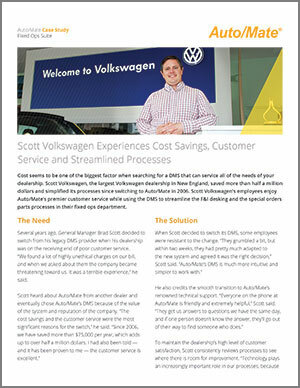 Download our case study to learn how our dealers experienced better support and cost savings by switching to Auto/Mate. Dealers today don’t have a partner in their DMS vendor. Instead, their DMS controls all of their data, throws hidden fees into their monthly bill and provides lousy support. How does this make business easy? With Auto/Mate, you control 100 percent of your data. Auto/Mate earns your business each month without the use of contracts and with free upgrades and the best support in the industry. Our team knows what you’re trying to achieve and the struggles you need to overcome because with more than 1,200 years of combined dealership experience, we’re car people ourselves. Life in the dealership is a journey. We call shotgun™.